from childhood dreams to millions. E-commerce strategy, Magento and Re-design. 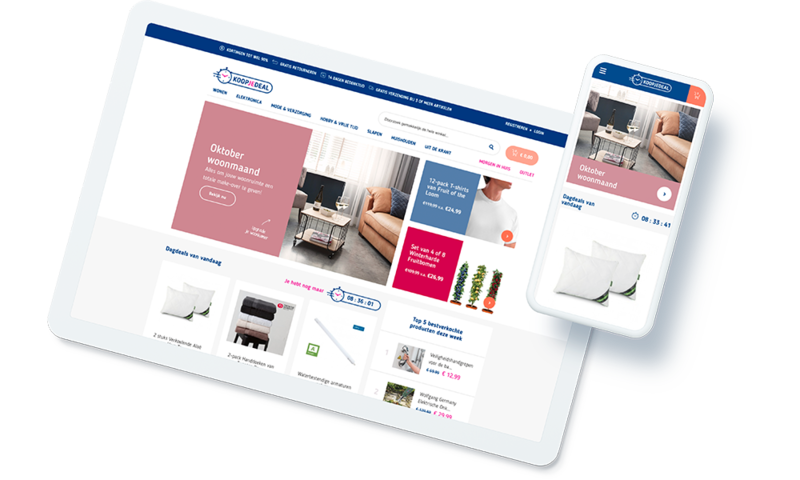 We created a whole new e-commerce strategy and connected all the different channels, resulting in an effortless customer journey. The goal of Koopjedeal was to evolve from a daily bargain provider to a fully branded webshop. They had multiple communication channels but these were not utilised efficiently. There is a lot of hidden value to be found when connecting multiple channels. Combining this with improvements to the webshop has realized this goal for them. We always start by determining the baseline. The objective is simple: determining where we stand now. First we conduct a code quality analysis, then make an inventory of how all channels perform separately. Setting a baseline makes it possible to determine made progress later on. We have optimized the business foundations, such as: customer service, fulfillment and the internal processes. This way we can guarantee that the service levels are respected. After all, it makes no sense to generate traffic without guaranteeing customer satisfaction. We do all the Magento development for Koopjedeal. This allows us to expand the platform time and time again with new technical ingenuity. Before coming to gracious the webshop was crippled by frequent and longlasting outages but by architecting a new deployment platform the webshop was stabilized and response times were greatly improved. We made and implemented a redesign which made it possible for the customers to place orders quickly and easily. We analyzed all processes extensively for this. This allowed us to optimize the conversion and improve the user experience. We did this through customer surveys and test panels. The channels were coordinated to create a healthy marketing mix. Channels that we use to achieve optimal results are: television, newspaper, display, social media and email. By thinking in a cross-medial way, we created synergy between the different channels. The vast majority of Koopjedeal sales consist of recurring product sales. These are generally products with recurring deals and lend themselves very well for marketing automation. If you have purchased a consumable item, you will automatically receive an e-mail to complete the inventory. This way you always have a reason to return to the webshop. That is the main reason why we can constantly optimize the customer journey. Now that everything is up and running, we work day after day to build an awesome brand. Om het bericht uniform over meerdere kanalen te communiceren, is een brandbook een vereiste. We hebben ons ook gericht op personalisatie via de webshop en e-mailmarketing, zodat de klant zich sterker tot het merk voelt aangetrokken. Om dit te bereiken hebben we de persoon 'Ilse' gecreëerd die rechtstreeks communiceert met de klant via meerdere kanalen, waardoor een gevoel van vertrouwdheid en verbondenheid. Relevante communicatie kan ervoor zorgen dat de klant tevreden is.